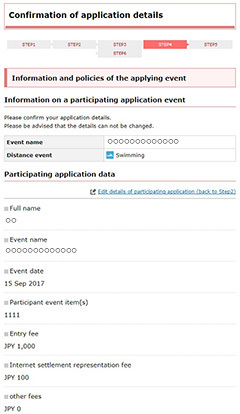 Click "Participation application" button in "Event summary" after confirmed the event details. 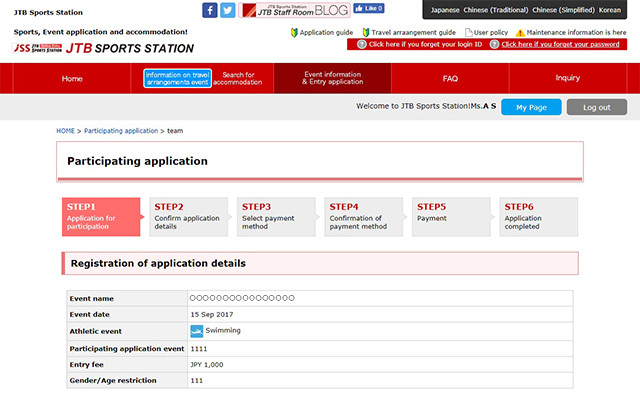 In an individual or a team application, click the "Application" and go to[STEP1]. 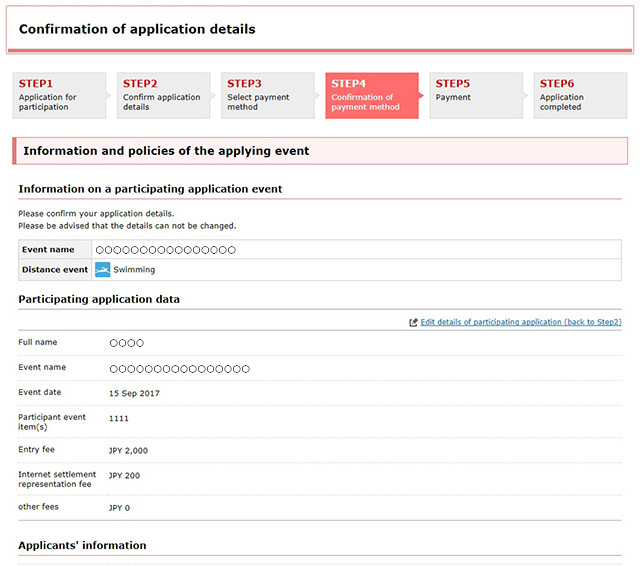 Confirm the details of the event in [STEP1], and enter the required information. 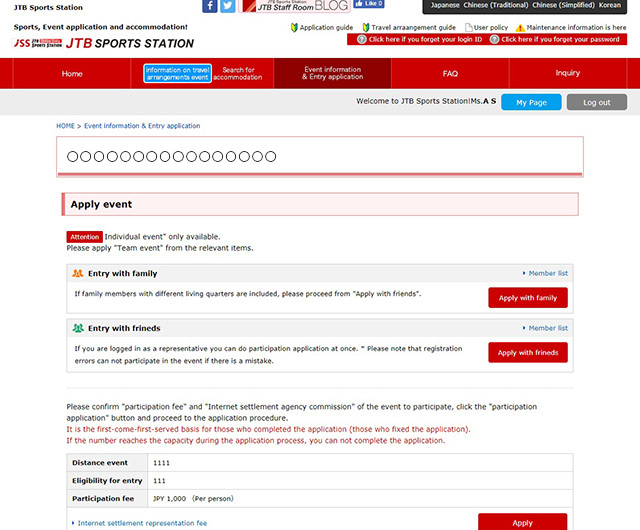 In the case of a team application item, it is necessary to create the following "runner list." 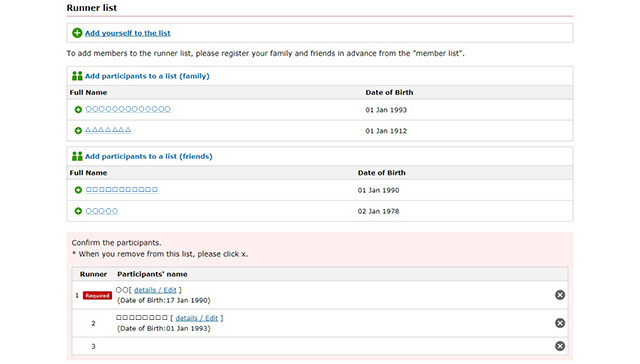 "+ Add yourself to a list"
"+ Add a participant to a list (family)"
"+ Add a participant to a list (friends)"
Click one of above, member selection list will be displayed. ill be displayed. Then add the runner in the list. 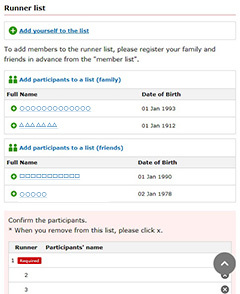 Click a "Delete X "button for delete the runner from the list. 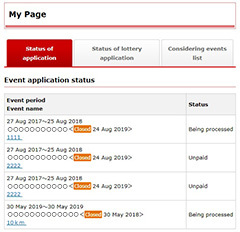 Please confirm the information and policies of the applying event. 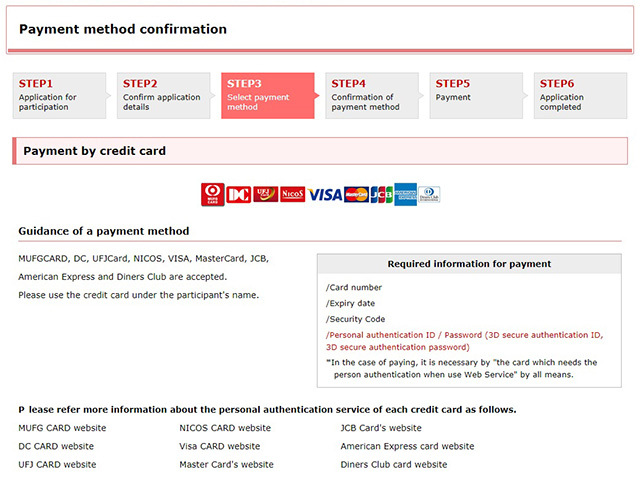 Then choose the payment method. 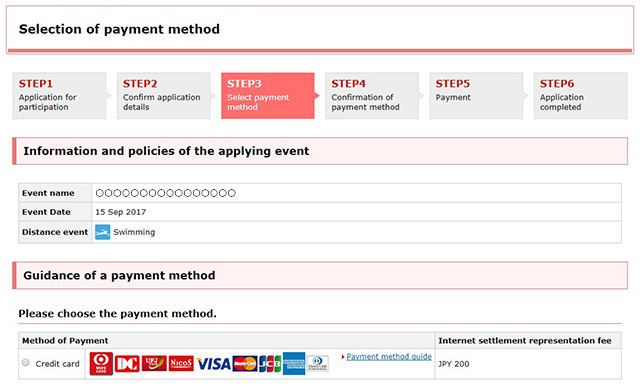 *Click "guide of payment method"link and confirm required infotrmation of the payment. Confirm the amount of the payment. Then click a "next" button to [STEP3]. 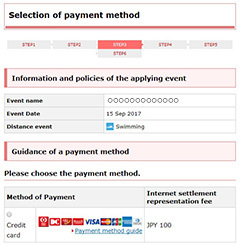 Confirm the selected payment method. *eg:) In case of credit card payment as above. Then click a "next" button to [STEP4]. 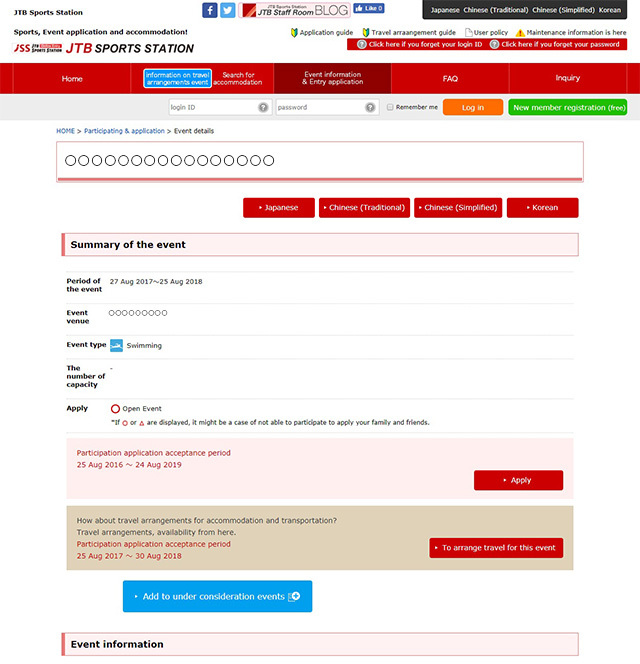 Confirm the details of application and complete the payment. 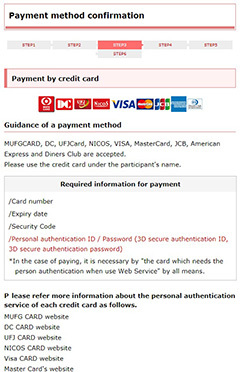 Please be advised No"payment method change", "item change / cancellation" can be made after this page. 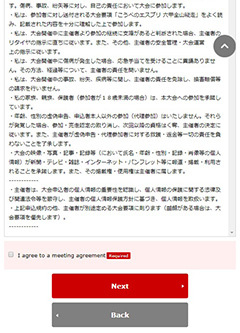 * From this page, the participation application event that you proceeded ahead will be displayed as "Unpaid" in "Status of Participation Application" of my page until the payment procedure is completed. 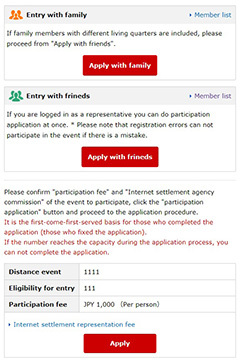 Completion of a participating application will display a participating application by [STEP5]. 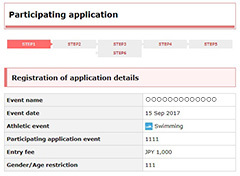 After "【STEP 5】 Participation Application Complete" is displayed, you can check the status of payment in "Status of participation application" on My page.